We are calling on the cat lovers of Victoria to help us find homes for 250 cats and kittens during our 2016 Adopt-A-Thon running for the month of April. Our North Melbourne and Campaspe shelters are bursting at the seams with cats and kittens looking to share their love with you. This influx of cats and kittens available for adoption is as a result of kitten season says Dr David Cunliffe, General Manager Animal Welfare and Customer Service. “Kitten season is the time of year when cats typically give birth, flooding shelters and rescue groups throughout the state with homeless kitten litters. “However, each year we are finding kitten season lasting longer and longer, putting strain on our resources. Often we’ll see new cats and kittens become available for adoption as soon as another finds their adopted home,” explains David. This is where we need your help! The Lost Dogs’ Home is aiming to find homes for 250 cats and kittens during our 2016 Adopt-A-Thon. 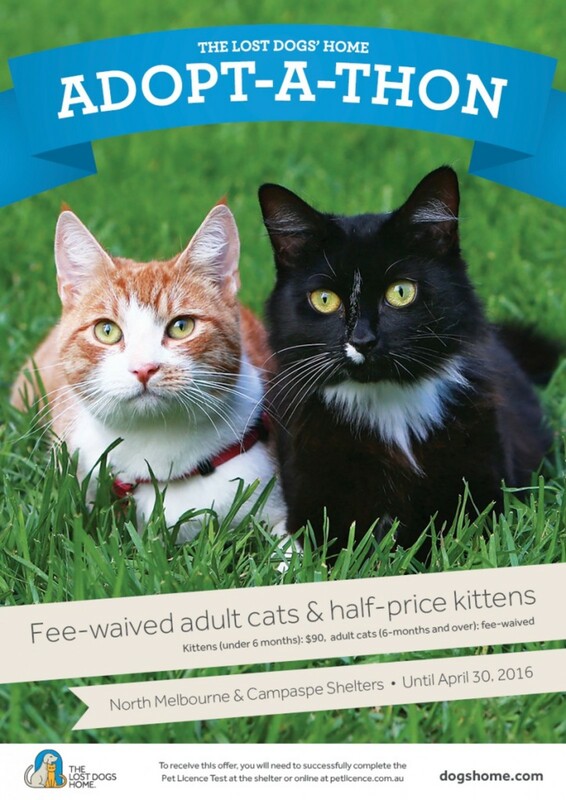 Starting tomorrow until April 30 we will waive the adoption fees of all cats six months and older. We are also halving the price of kittens under six months to $90. Each cat comes fully health checked, desexed, microchipped, vaccinated and wormed, all costing in excess of $300 per cat! If you are looking to adopt a cat or kitten into your family this April, come down to our North Melbourne and Campaspe shelters and help us achieve our Adopt-A-Thon target! Adopt: We have a number of cats and kittens just waiting to go to their new forever homes this April. You can view all our terrific cats and kittens at dogshome.com. If a fancy feline catches your eye, visit our North Melbourne or Campaspe shelters to meet them in the fur – our staff are keen to help you find your perfect match! Don’t forget to complete your Pet Licence Test in order to receive this offer. Foster: We are always on the lookout for foster carers to help for cats and kittens in need. With foster care periods lasting from two days to four weeks, this is a terrific way to give a cat time out in a home environment, while creating essential space at our shelters. All expenses are covered and successful applicants will be notified within two weeks of applying. For more information visit our foster care page. Advocate: If you are not in a position to adopt or foster, why not advocate for a cool cat looking for a new home this April? Share adoption candidate profiles via your Facebook page, email or even through good ol’ word of mouth!